Students in a Grade 2 class at St. Ursula’s School in Chatham learn how to properly brush, floss and take care of their oral health. The Ontario Association of Public Health Dentistry (OAPHD), along with public health units across Ontario, has launched an awareness campaign for Oral Health Month. According to Leeanne Pepper, a registered dental hygienist with the Public Health Unit in Chatham-Kent, the “Brush Up on the Facts: Keep Kids’ Teeth Healthy” campaign is geared to parents, and focuses on the impact dental health has on kids’ healthy growth and development and the free dental programs and services that are available for eligible kids 0-17.
Pepper and a team from the PHU have been visiting Grade 2 classes across the municipality this month, with the goal of making kids aware of the importance of brushing your teeth morning and night, flossing, drinking water instead of sugary drinks, and visiting the dentist on a regular basis. She said good oral health is important for a child’s self-esteem, sense of well-being and overall health. Cavities can be painful, impact a child’s ability to chew foods properly, and may affect their ability to pay attention at school or enjoy activities. In a presentation to a Grade 2 class at St. Ursula School in Chatham, Pepper showed the students how plaque can build up on teeth, mixing with sugar to create acid, which in turn, leads to cavities. She had lots of pointers for the kids, like drinking chocolate milk after exercise instead of Gatorade or juice, and showed the proper way to brush and floss. The each student was also given a water bottle, toothbrush, toothpaste, floss picks and a card to remind them to visit the dentist. Small steps can be taken today to help children avoid dental issues such as limiting sugary snacks and drinks, helping them brush and floss properly, and contacting Chatham-Kent Public Health for more information. Please visit OAPHD.on.ca or ckpublichealth.com for more information and answers to all of your dental questions, including if your child is eligible for free dental care. You can also call the Chatham-Kent Public Health at 519.355-1071 ext. 5700 or visit them on Facebook at Facebook/CKPublic Health or Twitter twitter.com/CKPublicHealth. 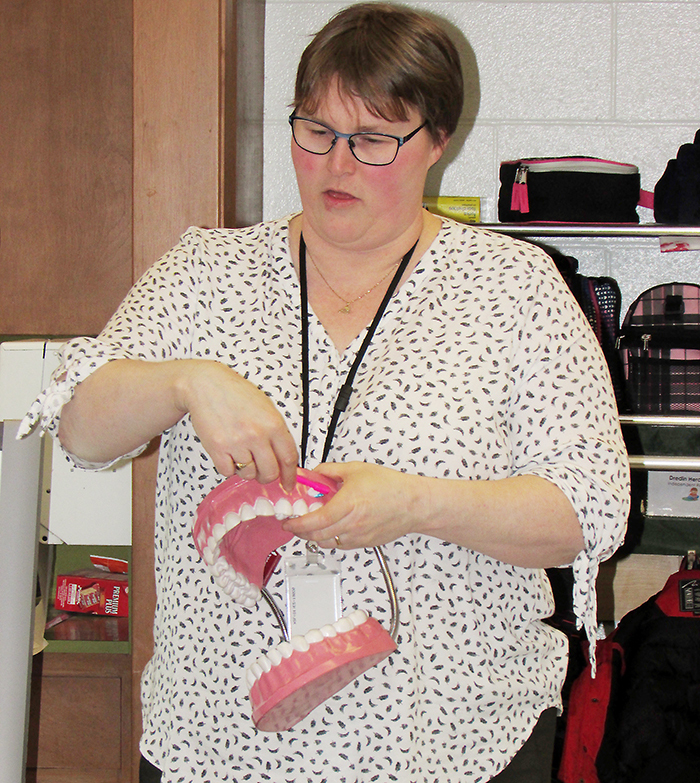 Registered dental hygienist Leeanne Pepper with the public health unit, showed the kids in a Grade 2 class at St. Ursula’s School in Chatham how to properly brush, floss and take care of their oral health.